The North Carolina Coastal Federation has teamed up with the town of Swansboro to develop a watershed restoration plan for the town, which will lay out a framework for reducing stormwater runoff that flows into the White Oak River and Queens Creek. Lauren Kolodij, deputy director of the federation, talks about the success of similar watershed restoration plans in other towns. 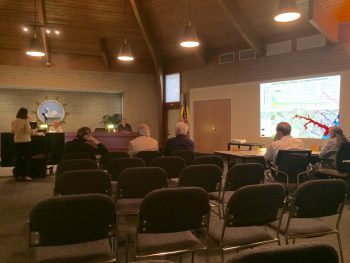 On Tuesday, Oct. 11, Mariko Polk, a stormwater GIS specialist for the federation, and Lauren Kolodij, deputy director of the federation, presented the background for the plan to the town Board of Commissioners and Planning Board. Polk described the goals and process of the plan, and how the plan will focus on the watershed as a whole. She identified bacteria from animals as the main pollutant in the watershed. Kolodij explained to the boards that the federation takes a “volume-reduction approach to stormwater,” rather than a pollutant treatment approach. The plan will focus on stormwater infiltration — allowing water to slowly soak into the ground — rather than directing it to waterways. By using techniques that reduce the runoff volume that enters waterways, pollutants will also be treated. “You’re thinking about rain as a resource rather than something to get off your land,” Kolodij said. One member of the planning board said he was pleased to hear that the plan would promote this strategy. He noted that he prefers this method over pipes in neighborhoods that quickly carry stormwater off properties and into waterways without filtering it. Kolodij said simple education and outreach to local homeowners and business owners will help them learn the benefits of allowing slow infiltration. One example of the effectiveness of volume-reduction is a rain garden that was recently built at a boat ramp in Cedar Point. The rain garden reduces the volume of polluted stormwater by collecting it and giving it a chance to soak into the landscape. As part of reducing the volume of stormwater, the goal of the plan is to “turn back the clock,” meaning restoring the watershed in a way that it mimics the hydrology of the watershed at a time when local waters were safe for fishing and swimming. Hydrology is defined as water movement and distribution. 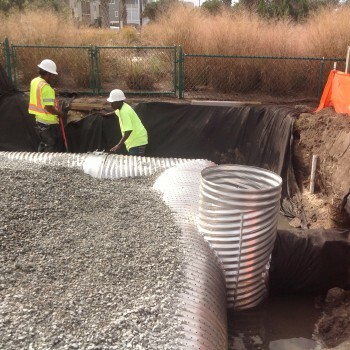 This Wrightsville Beach project disconnects drains that carry polluted stormwater directly into Banks Channel and allows the water to instead slowly filter into the sandy soils on the property. To restore the watershed in this way, partners will use a baseline year, one when the watershed was considered to be healthy. The watershed restoration plan will determine a targeted amount of stormwater that must be reduced so that it matches the same amount of runoff of the baseline year. Upon success of this long-term plan, the watershed will reopen for shellfish harvesting and reduce local swimming advisories. The key to a successful watershed restoration plan, Kolodij said, is to have multiple partners to help with the plan. She cited the Bradley and Hewletts Creek watershed restoration plan as an example of this success. The plan, currently being implemented in Wrightsville Beach and Wilmington, is showing results of 50 to 90 percent reduction in stormwater volumes. This is achieved through adding targeted stormwater treatment projects to developed land that currently does not treat stormwater. The draft for the plan is scheduled to be complete in December of this year, at which time the federation and the town will have to send it to state Division of Water Resources for approval. Many methods for stormwater reduction can be installed right at home. Learn more about these methods in Smart Yards, a guide for simple do-it-yourself stormwater reduction projects at home. To learn more about watershed restoration planning, please visit this page. Please contact Lauren Kolodij at 252-393-8185 for questions about the Swansboro watershed restoration plan.